The Sirens may be beautiful and elegant creatures, but they hide a dark secret in this new online slots at Slots Baby. If you know anything about mythology, then you will know to beware these fair maidens. Their calls and song are enough to lure any sailor to his watery demise. See if you can hold your nerve and escape their call by playing Sirens Serenade new slot games today! A few seafarers may fear jagged rocks hidden by waves or monsters of the ocean, but any sailor worth his salt will know that the sirens pose the biggest threat. Get the best out of our play slots with bonuses before you play the game! 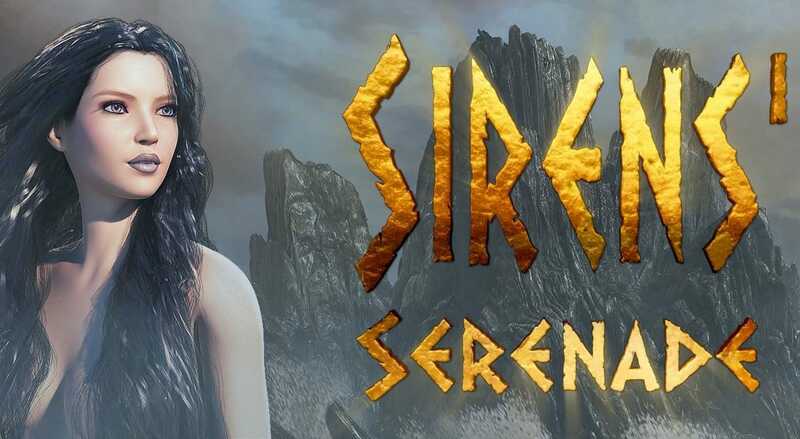 Sirens Serenade is a very elegant game from a very sophisticated casino slot developer. Saucify is known for their other hit games such as Captain Shockwave and Big Game Spin 16, but this is the first that sees them tackle the mystery of the sirens. The developers have taken great care with the graphics of this game and it looks as beautiful as the sirens themselves. It’s also got some great bonus features that could help you win big, no matter how loudly those sirens start singing at you. To play Sirens Serenade, you need to head out to sea to find the creatures in their natural habitat. You’ll be faced with a bracing seascape in front of which is a large rock. This rock is covered in the game board, and the waves are crashing against the bottom of it. You hearsome adventurous music and a low wailing will begin once you spin – is that the sirens calling you? Letters of the alphabet make up the bulk of the symbols on the board, but the ones you need to take notice of are the ones that depict se-faring adventures, such as boat sails, oars and torn flags. These are the higher-value symbols and will help you win the most money. The slot’s bonus features should help you out as well. WILD SYMBOL – The sirens themselves are the slot’s Wild. Unlike other games’ Wilds, these creatures take up two spaces. They help you make paid combinations and, apart from the Scatter, will replace other symbols. 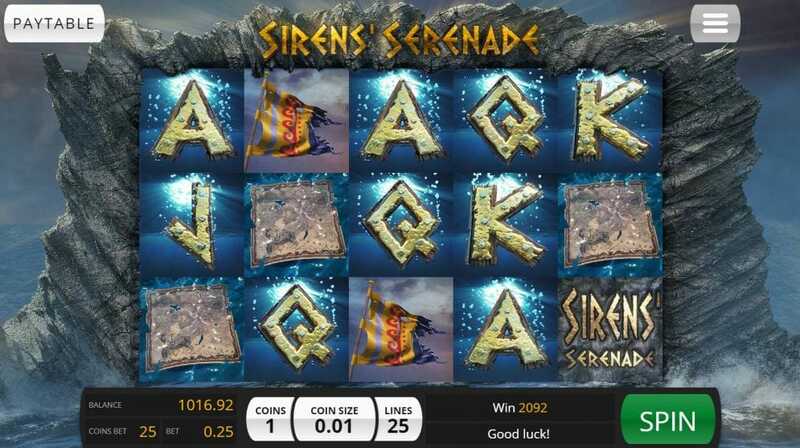 SCATTER SYMBOL – The sirens serenade slot logo is the Scatter. You’ll win something whenever you spin one. However, spin three, four or five, and you will win some free spins. With three Scatters, the sirens grant you ten extra goes. It’s four scatters for fourteen freebies and five for an impressive eighteen extra goes. 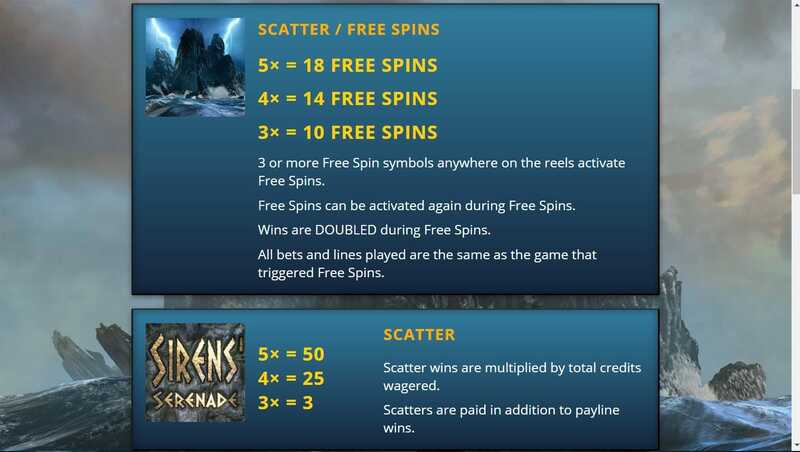 You can trigger even more free spins if you land more Scatters during a free spin.